Lions ranked 21st in final AVCA poll of 2018 season. 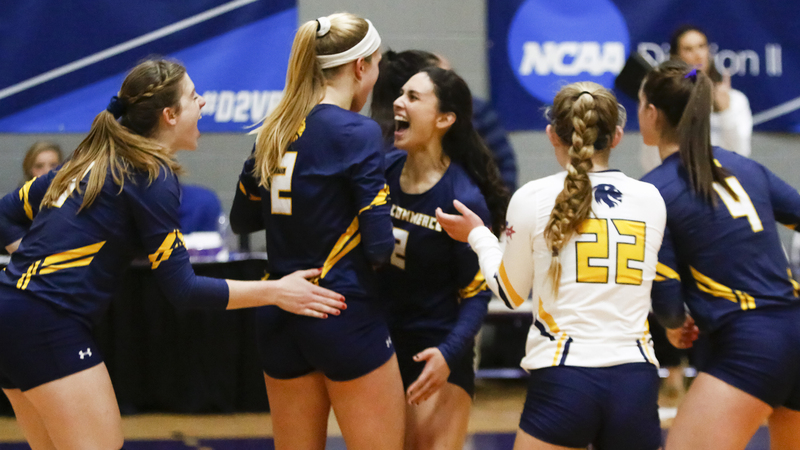 LEXINGTON, Ky.– The Texas A&M University-Commerce volleyball team is ranked 21st in the final 2018 season national rankings, as announced by the American Volleyball Coaches Association. The Lions have now been nationally ranked in 12 consecutive AVCA polls. The Lions had one of the most successful seasons in program history during the 2018 season. The team won 30 matches, the first time the team won has won at least 30 games since the 1987 season. The Lions also won the Lone Star Conference Tournament Championship, the first championship for the program in 31 years and the second tournament championship in program history. The Lions finished their season winning 23 of their final 25 matches, advancing all the way to the NCAA South Central Regional Championship match. During the season, the Lions defeated a handful of teams who finished the season in the national rankings. During the 2018 season, the Lions defeated Concordia-St. Paul, Lewis and Tarleton State, all of whom completed the season ranked in the top 10 in the nation. The Lions also had wins over Central Oklahoma, who finished ranked No. 23 in the country and had success over then nationally-ranked Regis. The Lions finished the season as the second-ranked team in the nation in both groups kills and team assists. A&M-Commerce finished fourth in the country in team attacks, 13th in team blocks, 15th in team digs, 16th in winning percentage and 22nd in kills per set. Junior Shelley Chapron was named an AVCA Honorable Mention All-American, and seven Lion were called to the All-Conference team. Celeste Vela was named the LSC Freshman of the Year and Craig Case was named LSC Co-Coach of the Year. Lions roll to 76-52 win over Central Baptist. COMMERCE – The Texas A&M University-Commerce men’s basketball team steadily pulled away on the way to a 76-52 win over Central Baptist College in the Field House on Monday night. The win brings the Lions to 8-2 overall on the season, with one game before the holiday break. Central Baptist counted the game as an exhibition contest. A&M-Commerce hosts Dallas Baptist at 7:00 p.m. Thursday for the final game before Christmas. There will be an Ugly Sweater Contest with Under Armour gift cards for the tackiest sweater. Photos will also be available with Santa Claus. Tickets are only $2 with the donation of a new, unwrapped toy. – The Lions shot 45.3 percent (29-of-64) from the field, with eight three-pointers. CBC was limited to 37.0 percent (20-of-54) shooting, including 32.1 percent (9-of-28) in the second half. – Tyree Robinson (Fall River, Mass.) led all scorers with 17 points and grabbed five rebounds. – Deonta Terrell (Chicago, Ill.) scored 16 points off the bench and had two blocks and four rebounds. – Reggie Reid (Harlem, Ga.) and Vernon Lowndes (Charleston, S.C.) each netted 11 points. – The Lions had 15 assists on 29 made buckets, led by four assists from Srdan Budimir (Karadjordjevo, Serbia). The visiting Mustangs shot the ball well early, scoring the game’s first five points. The Lions needed five minutes to take their first lead. Robinson threw down a dunk on an assist from Rooks to put the Lions up 12-11 with 15 minutes left in the first half. Rooks followed that with a three-pointer on the Lions’ next possession. A&M-Commerce proceeded to hold CBC off of the board for over six minutes, going on a 12-0 run. Lowndes’ triple at the 8:08 mark put the Lions up 27-13. The Mustangs responded and chipped away at the lead, cutting the margin to three points with 2:15 to play in the frame at 31-28. The Lions scored the final four points of the half and took a 35-28 lead into the break. After the teams went back and forth in the opening minutes of the second half, the Lions went on a run, and the lead never shrank below double digits. Terrell scored five points in a 9-0 run that saw A&M-Commerce push its advantage to 15 points at 49-34. Robinson’s layup at the 11:13 mark gave the Lions a 19-point edge at 55-36. The Mustangs managed to keep the lead around there until the Lions closed the game on a 12-2 run in the final five minutes. A stepback three-pointer by Lowndes with just over two minutes to play gave the Lions a 24-point lead, and that would also end up as the final margin. Tyree Robinson named LSC Defensive Player of the Week. 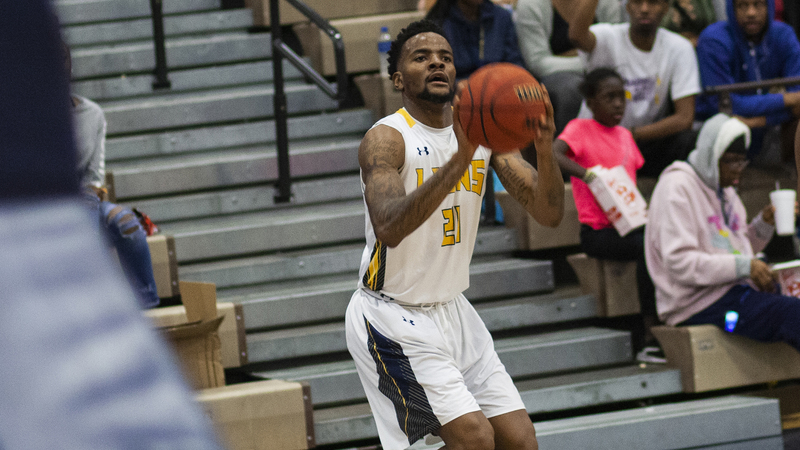 RICHARDSON – Texas A&M University-Commerce senior forward Tyree Robinson has been named the Lone Star Conference Men’s Basketball Defensive Player of the Week, as announced by the league office Monday. 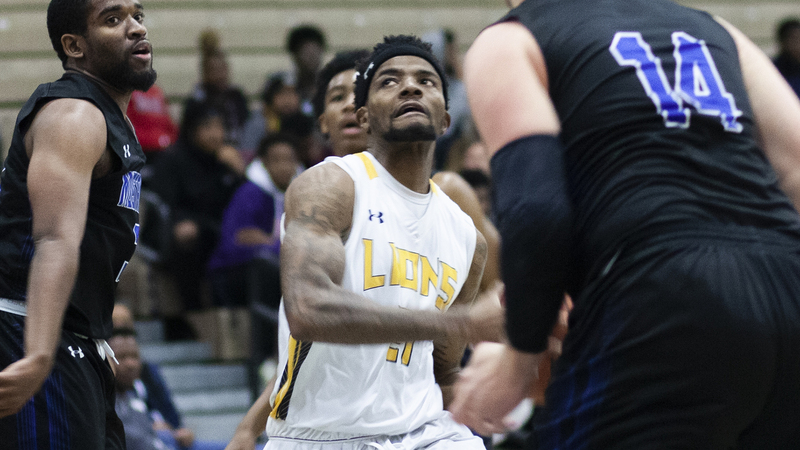 The senior from Fall River, Mass., was the Lions’ top rebounder and rim defender in a 2-0 start to the LSC season with wins over Angelo State and Texas A&M-Kingsville. He scored eight points with four rebounds in the ASU game, also swatting away two shots. He was huge on the boards in the Kingsville game, notching a double-double with 13 points and 12 rebounds, with a block and a steal. For the season, Robinson is averaging 11.4 points, 6.9 rebounds, and 1.3 blocks per game. The Lions earned LSC Defensive Player of the Week honors for the second straight week, as Trey Conrod was the award winner last week. 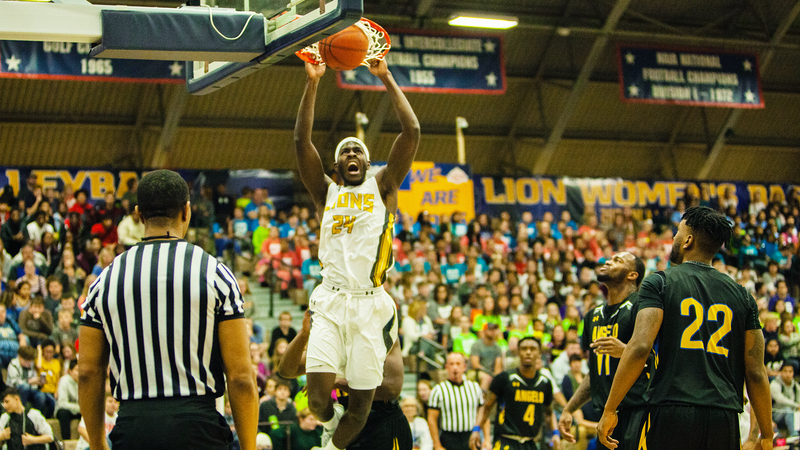 Robinson and the Lions host Central Baptist for a 7 p.m. tipoff Monday. COMMERCE – Texas A&M University-Commerce has announced a comprehensive national search for its next head football coach, following the departure of Colby Carthel. One year removed from winning the 2017 NCAA National Championship, Lion football is coming off a successful 10-3 season that featured an NCAA regional semifinal playoff berth. A&M-Commerce is one of only four scholarship programs in Texas to post three consecutive 10-win seasons over the last decade (Baylor, TCU, and Sam Houston State). The Lions are one of only three Division II programs to have an active streak of four consecutive NCAA playoff appearances. From its final two-deep roster of 2018, the Lions are slated to return 15 of 22 starters on both offense and defense. The announcement for season ticket information for 2019 is in early February of next year. “As an institution of distinction serving the Northeast Texas region, we have an outstanding opportunity to find our next successful leader for Lion Football,” A&M-Commerce President Dr. Mark Rudin said. “Our mission is to find a person whose priority is the success of our student-athletes – both in the classroom and on the field. We look forward to seamlessly transitioning our new head coach into our loyal A&M-Commerce extended family”. A&M-Commerce will have no further public comments on the search until the new coach is named. Lions pull ahead in the second half to earn a 73-68 win over A&M-Kingsville. 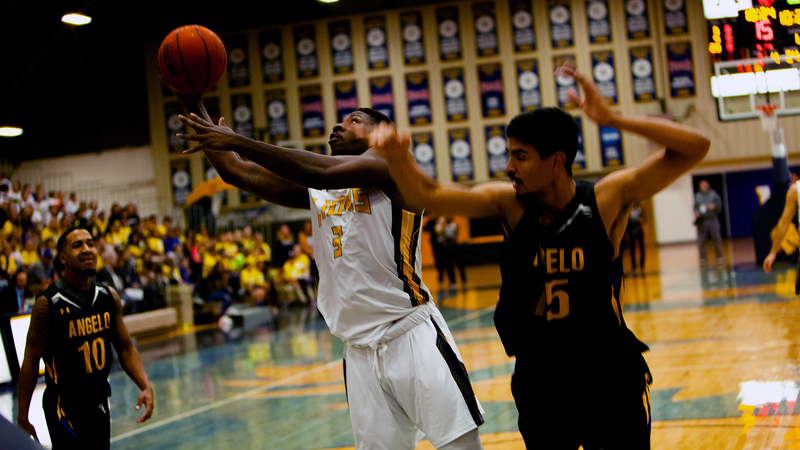 COMMERCE– The Texas A&M University-Commerce men’s basketball team defeated Texas A&M-Kingsville 73-68 on Saturday afternoon. The teams traded leads throughout the first half before the Lions pulled ahead and battled to get the win. The win brings the Lions to 7-2 on the season and 2-0 in the Lone Star Conference. The Javelinas fall to 3-4 and 0-2 in conference play. The Lions return to action on Monday against Central Baptist. The game will be at 7:00 p.m. at the Field House. Tickets for the game are available at WeAreLionsTix.com, by calling (903) 468-8756 or by visiting the Lion Sales & Service Box Office in the Field House. Admission to the game is $2 with the donation of a holiday toy, which goes to support Commerce Lil’ Angels. – After a back and forth first half which had six lead changes and four ties, the Lions took the lead late in half and never trailed in the second half. – Reggie Reid (Harlem, Ga.) led the Lions with 18 points, 12 of which came in the first half. He also led the team with five assists and five steals. – Deonta Terrell (Chicago, Ill.) had 16 points while Tyree Robinson (Rall River, Mass.) had a double-double with 13 points and a team-high 12 rebounds. – The Lions shot 40 free throws in the game, 26 of which came in the second half. The Lions scored five of the first seven points of the game, including a three from Reid. The Lions pushed their lead to six points after five minutes of play. The teams continued to trade baskets before the Javelinas cut the Lion lead down and took the lead at the nine-minute mark. The lead then started to trade hands multiple times, with neither team being able to pull away. The Javelinas built a four-point lead with four minutes to play before A&M-Commerce rallied back. A three from Terrell gave the Lions the lead with two minutes left; a lead A&M-Commerce would not relinquish the rest of the contest. The Lions took a 37-34 lead into halftime. Reid led the Lions with 12 points in the first half. Terrell had eight points and a team-high four rebounds. Both teams shot better than 40 percent in the first half. The Lions brought their lead to six points in the early parts of the second half before the Javelinas cut the lead back down to just two points at the 15-minute mark. Terrell and Reid each had a basket as the Lions brought their lead back up. The Lions got to the free throw line often in the second half, and it helped them build a lead. Leading by four with 12 minutes left, the Lions went on a 10-0 run throughout three minutes to make a 15-point lead, the largest of the contest for either team. The Javelinas attempted to come back, cutting the Lion lead to five points with under a minute to play. But A&M-Commerce would not be denied and made its free throws down the stretch to get the win. Lions set program-record with a 49-point rout of A&M-Kingsville. 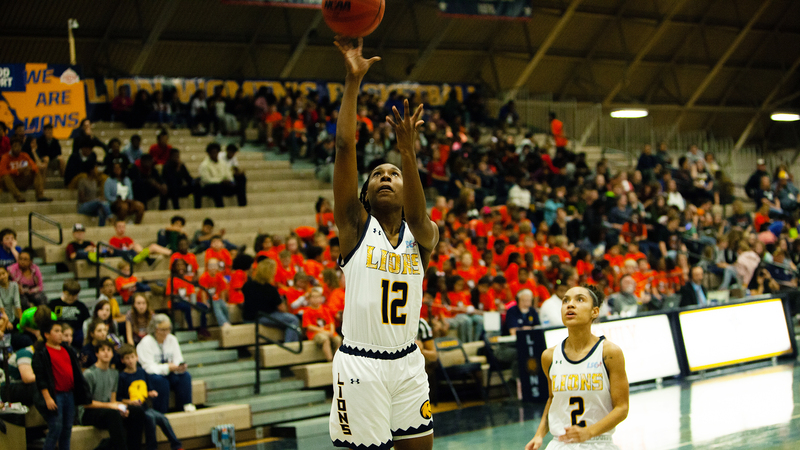 COMMERCE– The Texas A&M University-Commerce women’s basketball team defeated Texas A&M-Kingsville 87-38 on Saturday afternoon. The Lions jumped out to an early lead and kept on building. The 49-point win set a program-record for the largest margin of victory in a Lone Star Conference game. The win brings the Lions to 4-4 on the season and 1-1 in the Lone Star Conference. The Javelinas fall to 2-5 and 0-2 in conference play. The Lions will take an extended break before returning to action. Their next contest will be a home game on Dec. 18 against Northeastern State. The game will be at 2:00 p.m. at The Field House. Tickets for the game are available at WeAreLionsTix.com, by calling (903) 468-8756 or by visiting the Lion Sales & Service Box Office in the Field House. – The Lions led by as many as 52 in the game. The 49-point margin of victory set a program record for highest margin of victory in an LSC game. The last time the Lions defeated an LSC team by more than 40 points was the 2006-07 season when A&M-Commerce defeated two different LSC teams by 41 points. – Chania Wright (DeSoto) led the Lions with 19 points, including 15 over two minutes in the third quarter. She also had four assists, two blocks, and two steals. – Princess Davis (Shreveport, La.) had 13 points and led the team with seven assists. Jocelyn Pierce (Argyle) had nine points and four rebounds. – Agang Tac (Garland – Sachse) had six points and led the team with eight rebounds. Alexis Bryant (Pflugerville) led the team with three blocks. – All 11 Lions that saw action scored. – The Lions shot 58 percent from the field in the game and shot 42 percent from behind the arc. The Javelinas got off to a quick start, scoring five of the first seven points of the game. The Lions then got back into the game, with the teams tied at seven midway through the quarter. The Lion defense turned up the heat in the second half of the first quarter, holding the Javelinas scoreless for the remainder of the period. The Lions finished the quarter on an 8-0 run to lead 15-8 at the quarter. The Javelinas continued to struggle from the field to open up the second quarter as the Lion defense did not relent. The Lions pushed their lead to as many as 17 during the nine-minute scoring drought for A&M-Kingsville. The Lions pushed their lead to as many as 20 at halftime, leading 34-14 at the half. Davis led the Lions in scoring at the break with six points and also had two assists. Nine different Lions got on the scoreboard in the first half. Tac had six rebounds in the first half. The Lions shot 54 percent in the first half and held the Javelinas to just 23 percent shooting. The Lions continued to pour it on in the third quarter, pushing their lead to 24 points early. The Javelinas then went on a 9-2 run to cut into the Lion lead. However, the Lions finished out the quarter on an 11-3 run to push their lead to 30 points. The Lions opened the fourth quarter on a 9-0 run to bring their lead to 39 points, and the edge was brought to as many as 52 points late. The Lion reserves also shot the ball well, and the Lions left with the 49-point victory. 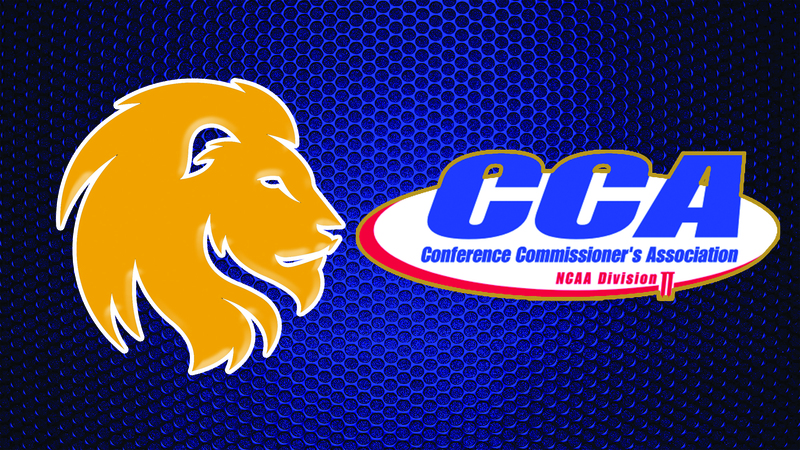 Lions lead Super Region Four with seven all-region selections by D2CCA. COMMERCE – The Texas A&M University-Commerce football team is represented by seven players on Division II Conference Commissioners Association All-Region teams, as announced Friday. The Lions have the most all-region players in Super Region Four, with three first-team All-Region selections and four-second-team All-Region picks. First team selections move on to the ballot for All-American consideration. Sports information directors in Super Region Four select the D2CCA teams. Representing the Lions on the first team are tight end Vincent Hobbs (Mesquite – Horn), return specialist Reggie Kincade (Everman), and kicker Kristov Martinez (Edinburg). Representing the Lions on the second team are offensive lineman Amon Simon (Humble – Atascocita), defensive lineman Michael Onuoha (Edmond, Okla.), linebacker Brucks Saathoff (San Antonio – Reagan), and safety Dominique Ramsey (Converse – Judson). Hobbs earns his first D2CCA All-Region honor. He was a Don Hansen’s Second Team All-American in 2017, second team all-Lone Star Conference in 2018, and first team all-LSC in 2017. This season Hobbs had 35 receptions for 343 yards and four touchdowns. He completed his Lion career ranked ninth in school history with 113 receptions for 1,356 yards and 15 touchdowns. Martinez adds to an impressive list of accolades, finishing his Lion career as NCAA Division II’s all-time leading kick scorer with 449 points. It places fourth in scoring among all college players in the state of Texas. The LSC’s all-time leading scorer earns all-region honors for the third straight year, elevating to the first team for the first time. He was 21-of-26 on field goals with a school-record long of 55 yards. He also made all 48 PAT attempts on the season and ended his career with a streak of 103 PATs made in a row. He was also fantastic in the kickoff phase, as the Lions finished the season ranked No. 1 nationally in kickoff coverage. Kincade earns his first career all-region honor thanks to a pair of kickoff returns for touchdowns – one for a school-record 100 yards against West Texas A&M, and another for 70 yards at Western New Mexico. For the season, he averaged 31.8 yards per return (668 yards on 21 performances). He also had an interception, a blocked kick, and 23 tackles on the year. Simon earns all-region honors for the first time in his career after being named first-team all-LSC. He started in every game for the Lions as a redshirt sophomore, establishing himself as one of the league’s top young talents and most dominant linemen. Onuoha is on the D2CCA honor list for the first time. The two-time all-LSC honoree made 47 tackles with 14.5 tackles for loss, 6.5 sacks, a forced fumble, an interception with a 48-yard return, nine quarterback hurries, and a pair of blocked kicks in his senior campaign. Saathoff also earns his first D2CCA all-region honor. He is a two-time all-LSC winner and finished the season with 103 total tackles, 15.0 tackles for loss, 2.5 sacks, a fumble forced, a fumble recovered, and a blocked kick. He finished his Lion career ranked third in school history in total tackles with 312, and his 52 games played are a school record. Ramsey’s electric playmaking ability earned him his first career all-region honor after earlier being named first-team all-LSC. He had three interceptions with 226 yards of returns and two touchdowns, including a 99-yarder, leading the nation in interception return yardage. He also averaged 12.9 yards on 36 punt returns with two goals. He made 37 tackles and had six pass breakups. Lions fall to ASU 70-64 in the conference opener. 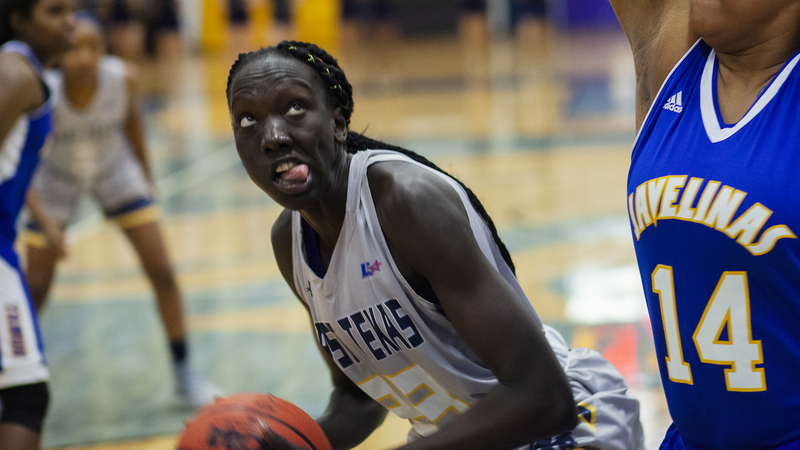 COMMERCE– The Texas A&M University-Commerce women’s basketball team lost 70-64 to Angelo State on Thursday afternoon. The Lions fell behind early in the fourth quarter and could not recover. The game was a part of Education Day, presented by Alliance Bank. A&M-Commerce hosted a school-record crowd of 2,446, comprised of local ISD students. The loss brings the Lions to 3-4 on the season and 0-1 in the Lone Star Conference. The Rambelles improve to 3-0 on the year and 1-0 in conference play. The Lions return to action on Saturday against A&M-Kingsville as they continue their conference season. The game will be at 2:00 p.m. at the Field House. Tickets for the doubleheader are available at WeAreLionsTix.com, by calling (903) 468-8756 or by visiting the Lion Sales & Service Box Office in the Field House. The Lion men’s game will immediately follow the conclusion of the women’s game. – Princess Davis (Shreveport, La.) led the team with 21 points. – Agang Tac (Garland – Sachse) led the team with a career-high 17 rebounds. It was just the 19th game in program history where a player had at least 17 rebounds in a game. – Alexus Jones (Lewisville – Aledo) had nine points while Ekaterina Zhibareva (Liske, Russia) had eight. – Maddison Glass (Missouri City – Hightower) led the team with five assists. – The game attendance was 2,446, comprised mostly of local ISD children as part of Education Day presented by Alliance Bank. The mark set a new school record for single-game attendance. The Rambelles got off to a hot start, taking an 11-2 lead right out of the gate. The Lions broke the run on a layup from Davis. However, ASU pushed its lead to 13 points with three minutes to play. The Lions then went on a 5-0 run to cut the ASU lead to seven points. The teams began to trade hoops, and ASU went into the second quarter leading 24-14. The Lions had one field goal in the first five minutes of the second quarter, and ASU had zero as both teams struggled from the field in the second quarter. Trailing by nine with five minutes to go, the Lions then went on a 6-0 run over two minutes to cut the Rambelle lead to just three points, including two layups from Davis. ASU took a 31-25 lead into halftime. The Lions cut the ASU lead to three points early in the third quarter as A&M-Commerce went on a 4-0 run. The lead fluctuated between four and eight points for the rest of the quarter. The Rambelles took a 47-42 lead into the final quarter. The Lions opened up the quarter on a 4-0 run, with two layups from Davis, cutting the Rambelle lead to just one point. ASU then went on another run to build its lead back up. The Lions could not overcome the gap, falling 70-64. 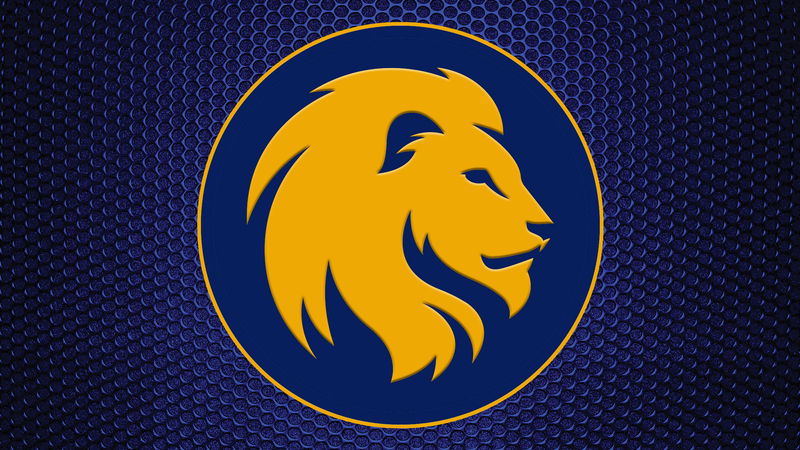 COMMERCE– The Texas A&M University-Commerce men’s basketball team defeated Angelo State 81-72 on Thursday afternoon. Behind the roars of more than 2,000 local ISD school spectators, the Lions overcame an 11-point deficit in the second half to get the win. The win brings the Lions to 6-2 on the season and 1-0 in the Lone Star Conference. The Rams fall to 5-2 and 0-1 in conference play. The Lions return to action on Saturday against A&M-Kingsville as they continue their conference season. The game will be at 4:00 p.m. at the Field House. Tickets for the doubleheader are available at WeAreLionsTix.com, by calling (903) 468-8756 or by visiting the Lion Sales & Service Box Office in the Field House. The Lion women’s team will tip off against A&M-Kingsville at 2:00 p.m. The men’s game will immediately follow the conclusion of the women’s game. – Reggie Reid (Harlem, Ga.) led the Lions with 20 points in the game and also had three assists and six rebounds. – Deonta Terrell (Chicago, Ill.) had 15 points, shooting 5-of-9 from the field and 5-of-6 from the foul line. – Trey Conrod (Kilgore) and Willie Rooks (Houston – North Forest) each had 11 points in the game. – The Lions shot 57 percent in the first half. After shooting 52 percent in the first half, the Lions held ASU to 33 percent shooting in the second half. – The Lions had six blocks in the game. – The Lions led by as many as 14 in the first half and ASU led by as many as 11 in the second half. – The game attendance was 2,446, comprised mostly of local ISD children as part of Education Day presented by Alliance Bank. The Lions got off to a hot start, scoring the first eight points of the game. After ASU scored four points, the Lions again went on a run, scoring seven in a row to take an 18-4 lead. For the next couple of minutes, the teams traded points before ASU started to climb back into the contest. ASU cut the Lion lead to single digits before the Lions again pushed their lead to 11 points with eight minutes to go. ASU again went on a run as the Lions hit a cold streak. The Rams scored eight in a row to take their first lead of the game at the four-minute mark of the half. It was part of a 16-2 run that pushed ASU’s lead to six points. The Lions went into halftime trailing 44-39. Both teams shot a high percentage from the field in the first half as the Lions shot 57 percent and ASU shot 51 percent. ASU got to the foul line 10 times in the half while the Lions shot just one free throw in half. Reid led the Lions with eight points in the first half. Conrod and Rooks both had seven points. ASU brought its lead to seven points early in the half before the Lions cut the deficit to a one-score advantage with 14 minutes left to play. Leading 53-49, ASU again went on a 7-0 run, taking their largest lead of the contest at 60-49. With five minutes left, the Lions trailed by 10. Not knowing the word quit, the Lions began to chip away at the ASU lead and went on a 14-3 lead to take their first lead of the second half with 1:26 to play. It was a lead the Lions would not surrender. ASU had multiple possessions end without a made basket, and the Lions made their free throws to get the win.